Only have 24 hours in Barcelona? 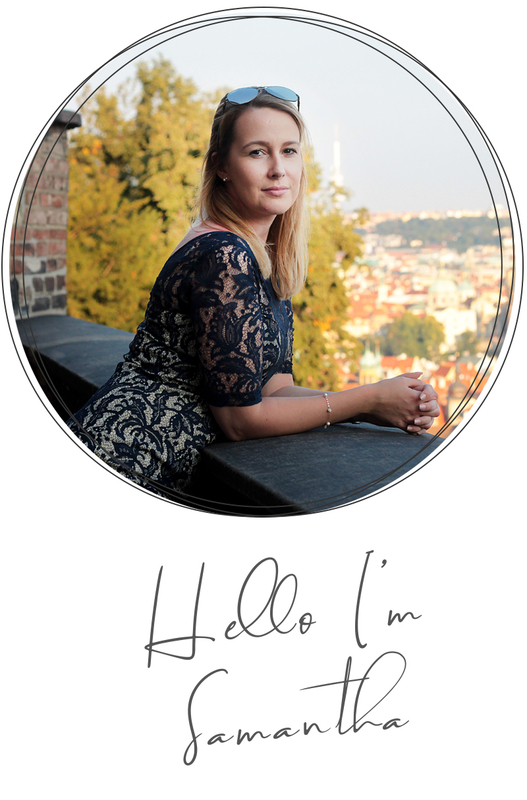 Here is how I spent my first 24 hours in the coolest of European cities, discovering Guadi’s magnificent architecture, discovering some cultural gems and highlights and having fun without exhausting my day, over packing my itinerary and leaving the city disappointed! I started my day at 9am from Plaça Catalunya, where I took the metro to Hostafrancs stop which is located at the bottom of the hill that leads up to the Museu Nacional d’Art de Catalunya. I chose this as my first destination in the morning while I was still full of energy. 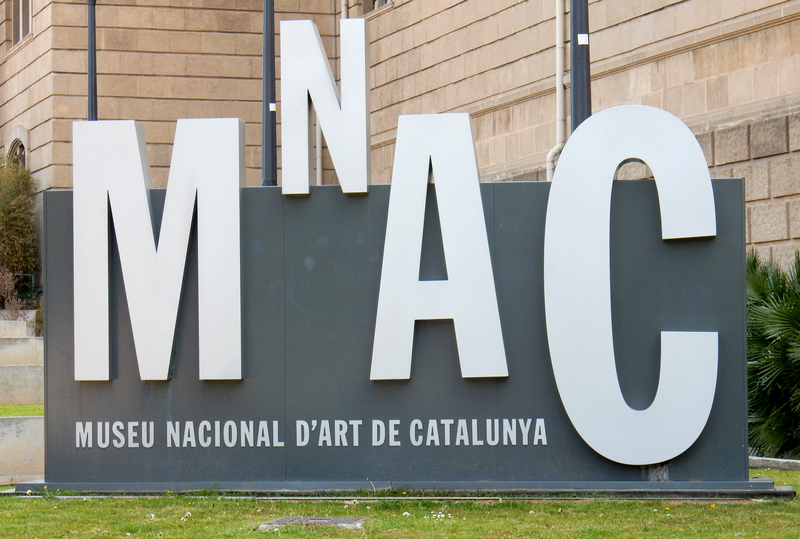 It is one of the most important museums in Barcelona and also one of the biggest, so I was quite selective in what I wanted to see! You can take a bus all the way to the top or take a casual stroll through the square and up the steps to the very top. I am also sure there is an elevator that takes you from the bottom of the hill to the museum entrance. 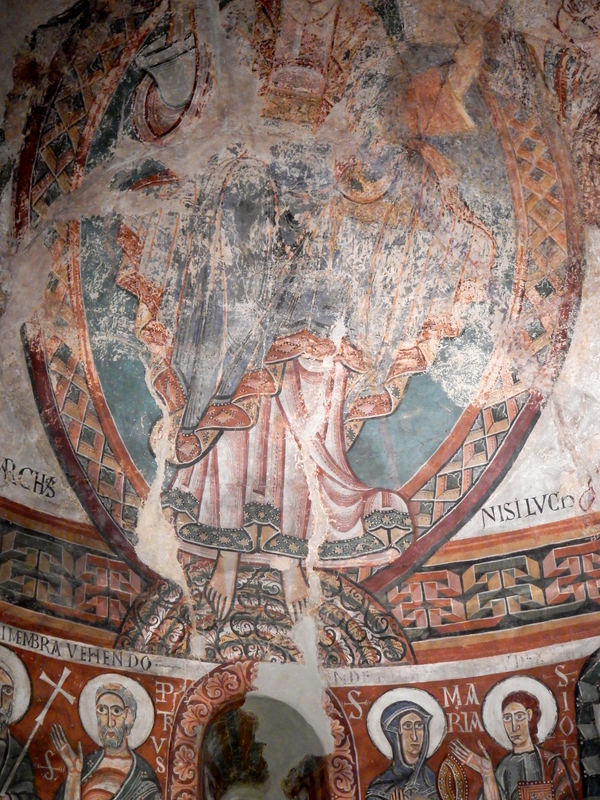 The first area I headed to was the Medieval Romanesque Art exhibition, a collection of 11th – 13th century mural fresco panel paintings that have been taken from various chapels and churches from around Catalonia, in the high Pyrenees to be loving restored back to their former glory as much as possible. The collection is some of the oldest and biggest examples of Romanesque panel paintings in Europe. Walking around the exhibition felt like I was walking around an ancient church and the pieces of art are truly amazing. I spent so much time looking around that I lost track of time. Next I headed to the Dome room, a bright and expansive foyer that has the most beautiful dome ceiling painting I think I have ever seen! It was commissioned by three Spanish artists who each individually worked on three separate parts of the dome room. 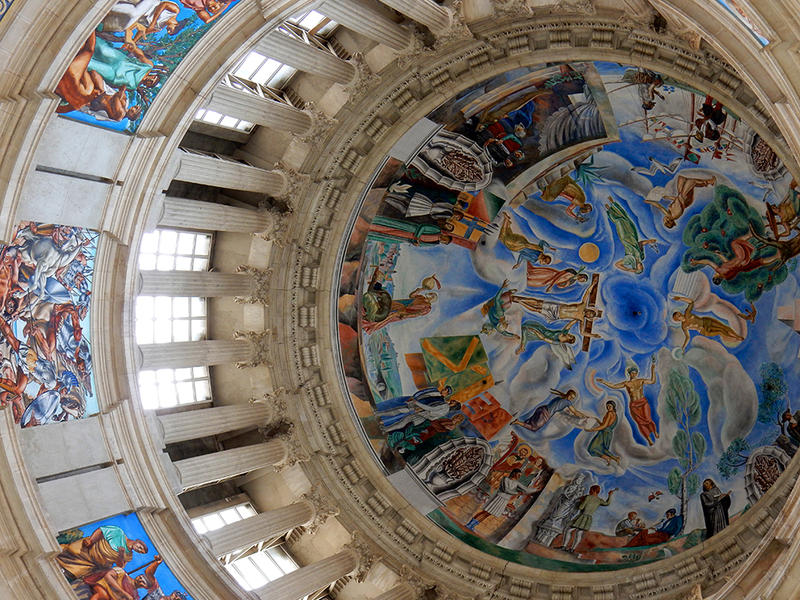 The dome itself has been painted to represent Religion, Science, the Fine Arts and the Earth. The drum circular painting in the dome represents the eight historic generations including the Phoenicians, the Greeks, the Iberians, the Celts, the Carthaginians, the Romans, the Visigoths, and the Muslims. It is said the exterior of the dome was created and built based around St Peters Basilica in the Vatican City in Rome. Lastly I headed to the rooftop viewpoint, an area of the museum it appeared not many knew about! Boasting a panoramic view of Barcelona, it is definitely one of the best viewpoints in the city and worth the visit just for the views! Entrance to the terrace is included in your ticket price. At around 1230 I had seen most of what I had planned to see. Upon exiting the museum I spent a couple of minutes taking in the vibrant atmopshere outside and the amazing views from the top of the hill down to the Plaça Espanya. Next I decided to walk to the nearest metro stop which took around 20 minutes through the back lanes of the museum. The route took me past the Museu d’Arqueologia de Catalunya and some beautiful gardens with a Greek theater. I knew that with only 24 hours in Barcelona I wouldn’t have time to stop and explore so I continued down to the Poble Sec metro station where I took the underground subway to Liceu located on one of the most famous streets in all of Barcelona, La Rambla. La Rambla actually means the river, and the street would of been a river back in ancient times when Barcelona was a small walled city. My next stop was just a short walk from the metro station. 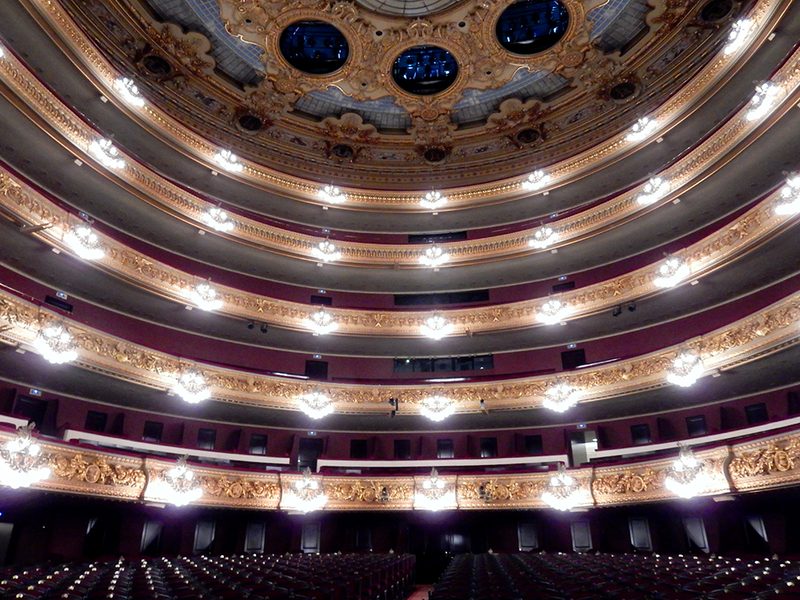 I am a huge fan of opera, so when I read that Barcelona had the world’s state of the art opera theater I knew I would have to include it on my off the beaten path 24 hour Barcelona itinerary. I was in for a backstage tour that would take me through its turbulent history and in to its unseen areas! I was so excited! It was first established in 1847 when the city was crying out for more entertainment and musical establishments. In 1861 a terrible fire broke out in the theater destroying the Auditorium and stage. In just one year they managed to reconstruct the stage and it reopened in 1862. In 1994 the building was caught on fire yet again, its second devastating fire that caused the opera theater to be completely closed and its very existence to be questioned. It was finally decided to reconstruct and rebuild the opera theater better then ever. Taking almost five years in the making, the new and present theater opened in 1999 in a similar style to its predecessor but it is also now home to the world’s first state of the art stage. Something the people of Barcelona are incredibly proud of. Unable to purchase the privately owned land to the sides of the theater, they cleverly designed and expanded the new building by building down into the underground instead of building sideways. What was created was a unbelievable stage that that rises 40 metres above the level of the stage and goes down 24 metres below this level. Upon entering the underground level, the air smelt damp and it was colder then upstairs. I was told the underground levels of the theater lie lower then the city’s subway. Our guide also explained that the famous statue of Christopher Columbus down by the port would be able to fit its entire height into the areas of the stage. 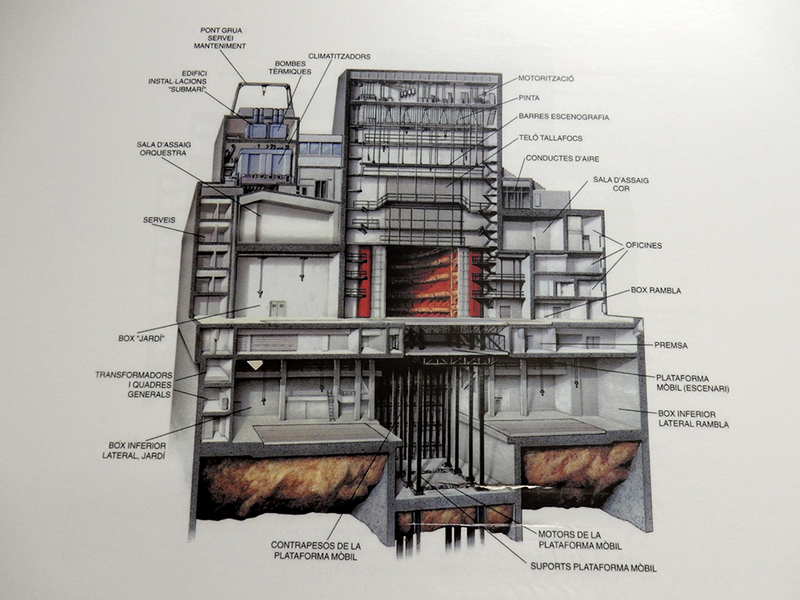 The idea allowed the theater to run multiple operas at any given time, by lowering the stage sets into side slots (BOX INFERIOR) as shown in the diagram. 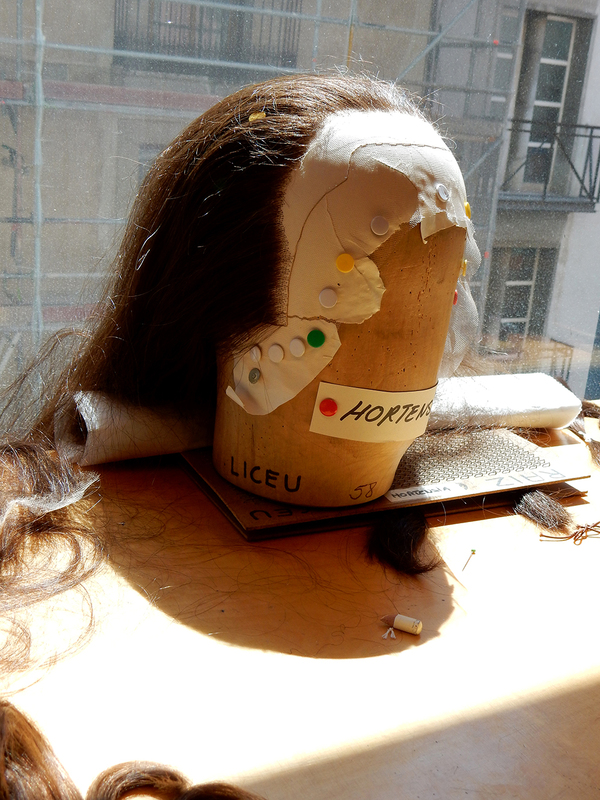 I was shown into the hair and costume department where I was shown just how meticulous and tedious making a wig for an opera is. The real human hair is purchased for hundreds of euros and each strand is placed into a custom made wig for each actor. I was also show various other dressing rooms and backstage areas that included where they also construct each opera stage. By 2pm it was well and truly time for lunch. I took a short walk to Fabrica Moritz Factory and Bar for a rather different lunch experience. 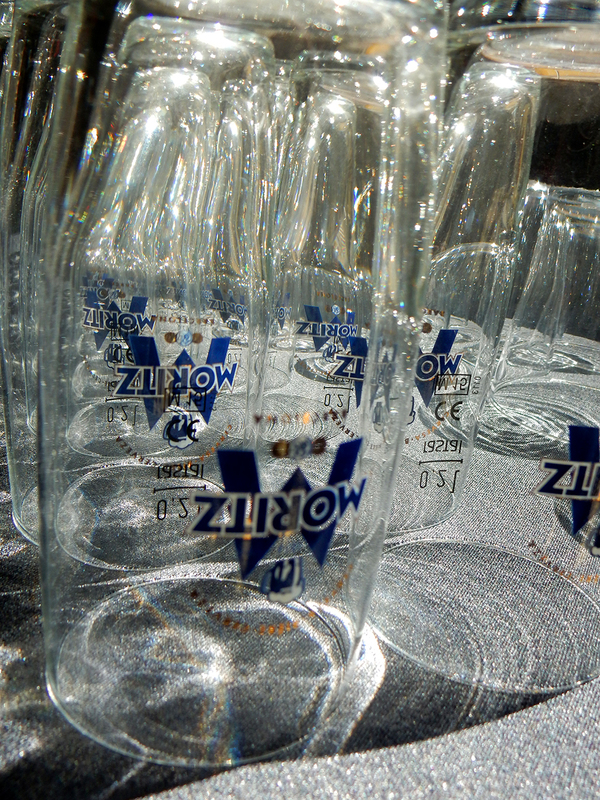 Moritz beer is a Catalan brand that has more than 150 years of beer making history in Barcelona. A visit to their bar, restaurant and factory in the heart of Barcelona allows you a unique opportunity to learn about its history, see how traditional Moritz beer is being produced and sample some of its beer, brewed on the premises. It is the only beer made entirely with natural mineral water from the Font d’Or springs of Montseny, a beautiful area of natural beauty just under an hour from Barcelona. Its beer is a light tangy taste full of bubbles. I am not a huge beer fan but I loved the lightness! 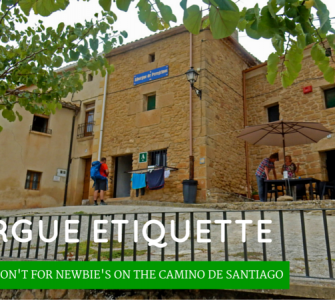 Paired with small tapas style dishes it was the perfect rest stop I needed. When I finished lunch it was just a short 9 minute walk to my accommodation for the night, the beautiful and boutique small luxury hotels of the world Hotel Cram Barcelona. Perfectly located close to La Rambla and Plaça Catalunya both perfect places to hang out in the evenings and grab something to eat! It was easier to drop my things off at the Hotel instead of carrying them around with me for the rest of the day. I was also meeting my partner Leo who had ridden on our Harley Davidson all the way from Prague to Barcelona so was I super excited to see him after 2 weeks of travelling solo! 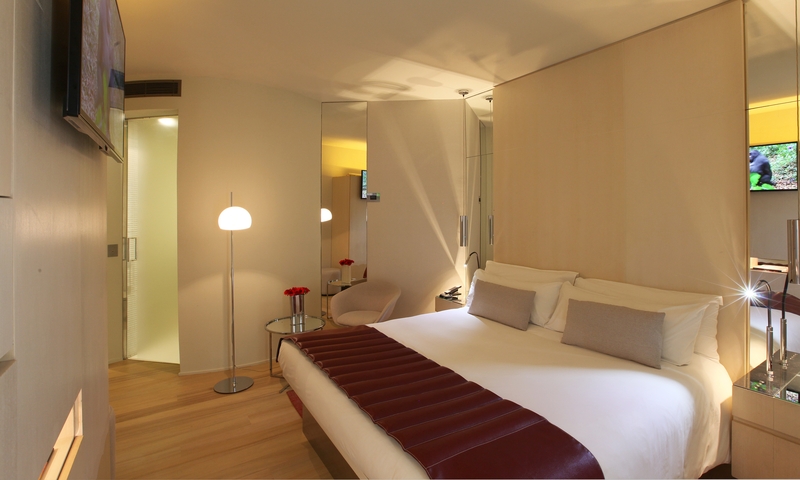 I loved the bedroom and the whole feel and style of the hotel. 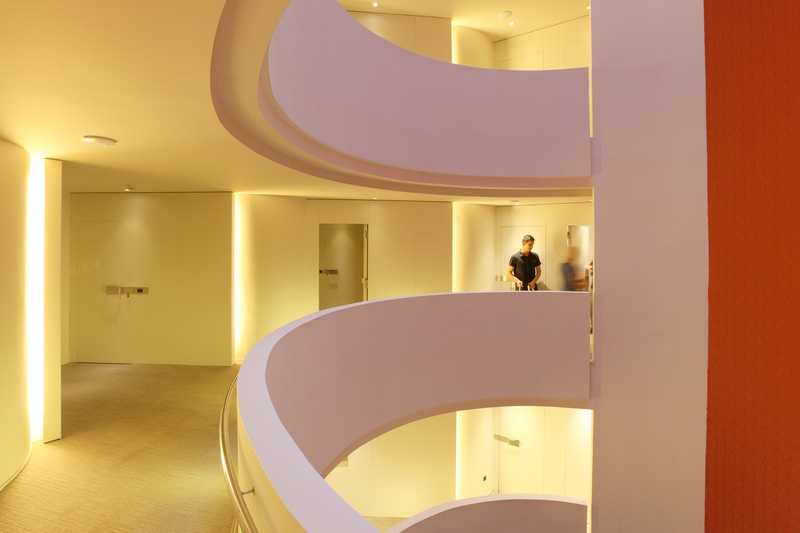 The interior appeared to be designed around the “C” shape and even the bedroom had a distinctive “C” shape feel to it. It was wonderfully modern, spacious and came complete with its own selection of luxurious toiletries which was great because after 2 weeks of travelling I was almost out! By the time we had checked in and freshened up it was already 16:30. While I had a ton of places on my list to visit, I knew there was no way I would do them during my 24 hours in Barcelona. So again for my evening activity I had to be selective. But I couldn’t decide. On my way out of the hotel we asked the kind receptionists what they suggested. 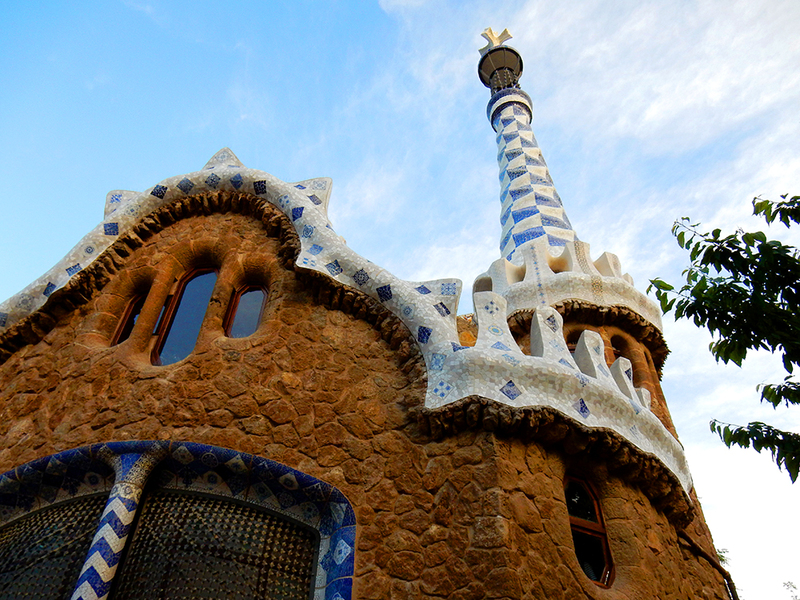 While there were numerous attractions just a short walking distance from the hotel, the gentlemen suggested heading to Park Guell, a popular attraction for lovers of Gaudí’s masterpieces and a romantic setting for an evening stroll. So we hopped on the metro again from Passeig de Gracia and got of at Vallcarca, the closest metro station to the Park. What we weren’t prepared for was the huge walk and the mass amounts of steps to the top of the hill for the top back entrance to the park. It wasn’t sign posted particularly well so we got a little lost but we found it in the end! A huge benefit of visiting Park Guell in the evening is there were far less tourists and the queue for an entrance ticket was non existent! So once we purchased our tickets we were able to leisurely stroll straight into the main areas. If you visit here spend time to explore all areas of the monumental zone. We took a peaceful stroll through the Modernist styled columns that looked like tree trunks and we fell in love with the Dragon fountain and the staircase. 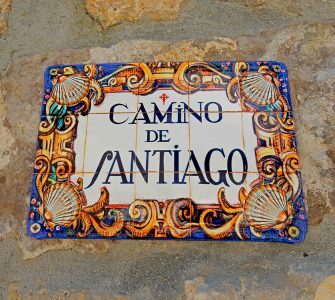 The colours of the tiles were mesmerizing and the small houses were like nothing we had seen before. 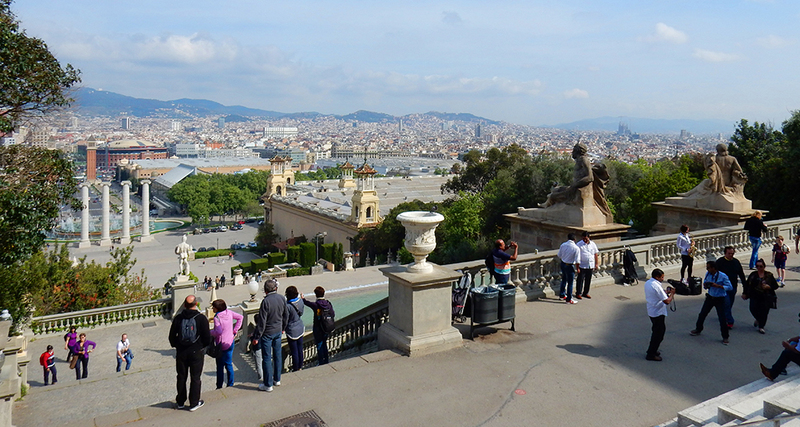 What we enjoyed the most was the amazing views across Barcelona from the top of the park and the huge platform. Since the sun had already begun to set, the colours of the city glistened with the shining blue sea background. 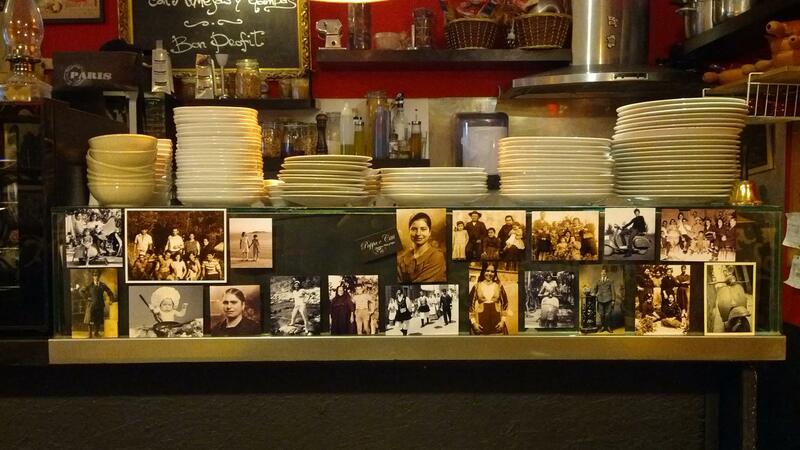 We stumbled across a small Italian restaurant called Pappa e Citti Barcelona. Small and super cosy, this authentic Italian restaurant had an amazing choice of seafood on the menu and their pasta dishes were huge! For the money we paid 50 euro for two starters, two mains and a bottle of wine it was incredibly good value! 2300 – 0900 Time for Bed! Finally after a full day exploring some of Barcelona’s cultural highlights we fell into our comfortable bed back at the Hotel Cram. I knew when I had planned only 24 hours in Barcelona that I wouldn’t be able to see the typical sights because the wait in line would be too long, and I wanted to save something so I would have a reason to come back to the city. At 9am the following morning we departed Barcelona on our 600 km Harley Davidson ride to Saint Tropez for the Harley Davidson Euro Festival. All I can say is it was a long ride! 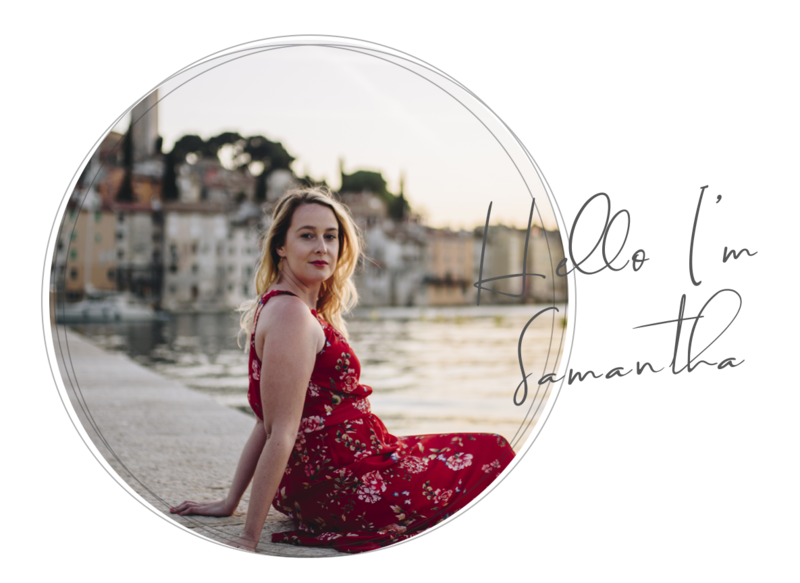 Disclaimer: I was a guest on an organised tour courtesy of Barcelona Tourism, who I greatly thank for the opportunity to experience the backstage of some of Barcelona’s cultural gems. 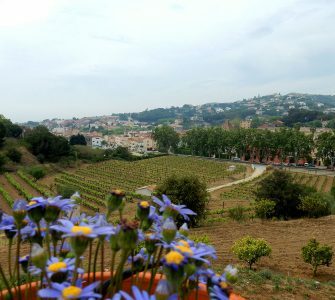 Subsequently – tours to the Opera theater are restricted to certain areas and some of the areas mentioned in this post are not possible to visit during a standard visit. 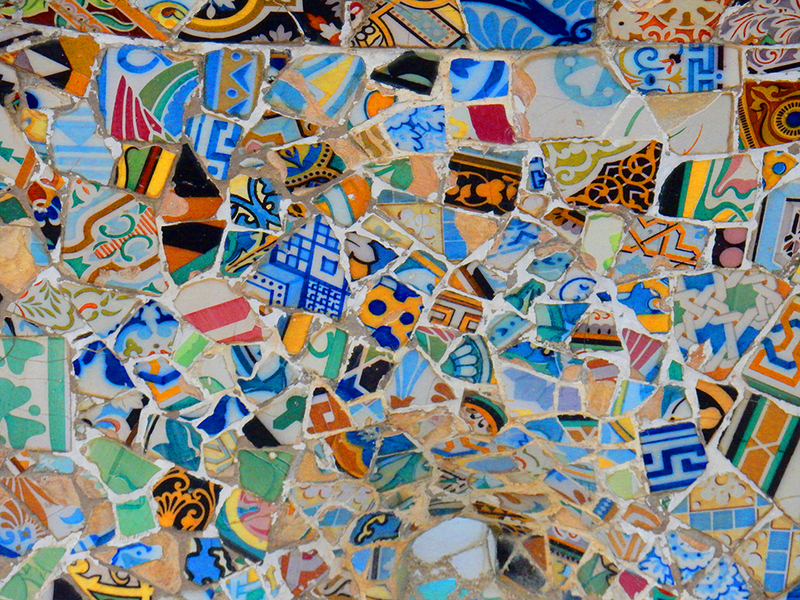 It has been way to long since I was in Barcelona, I need to get over and see all these wonderful things. 24 hours might not be a long time but we have done that with cities too and you can actually see a lot in that time as you did. 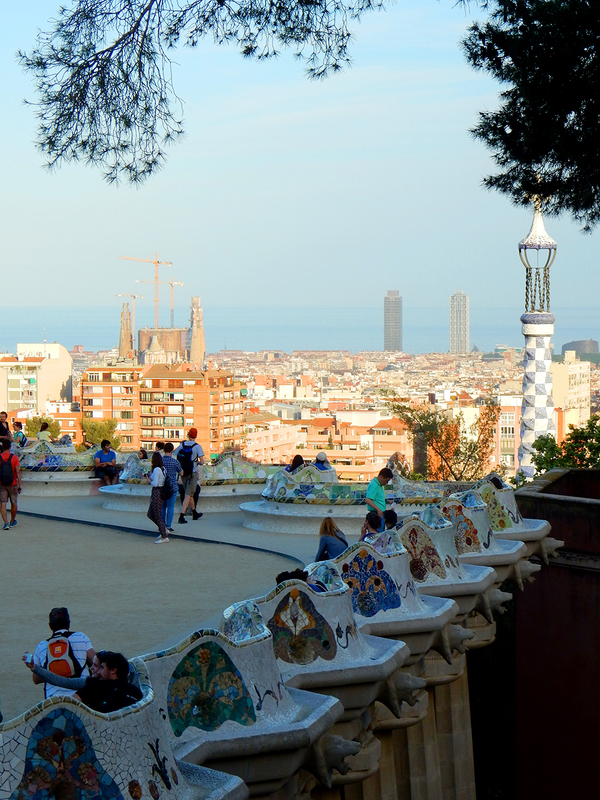 We’re headed to Barcelona next week and while we do not tend to be museum people we will definitely be checking out Park Guell. That view is fantastic! Thanks for the suggestion! Its hard to see a lot in 24 hours but you managed it!!! 🙂 Glad to got to see the highlights! Sounds like a pretty interesting 24 hours for sure! 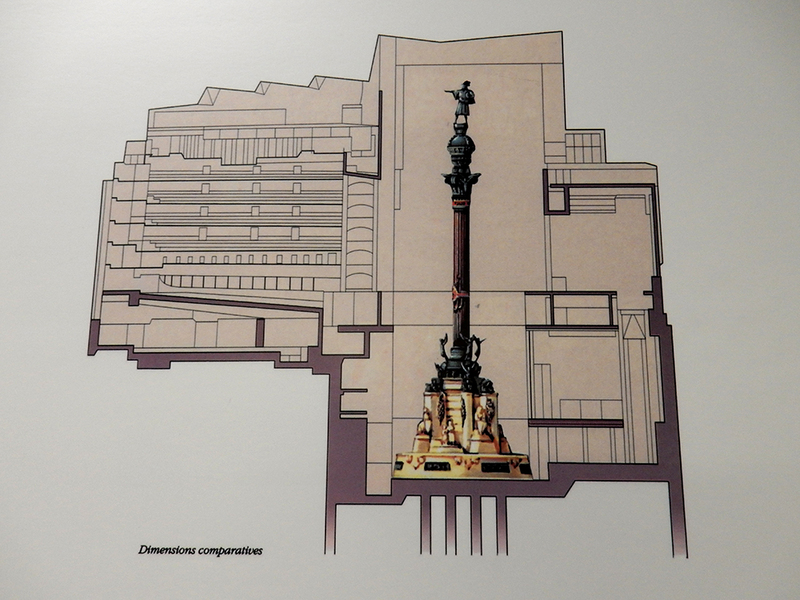 We have been planning for Barcelona for a long time, maybe soon! !